We are passionate about quality here at Swihart Industries, Inc. We live and breathe quality. 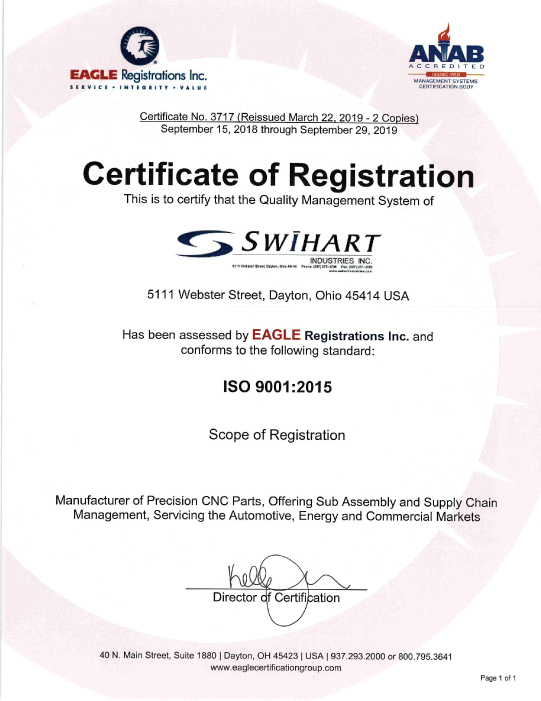 We are ISO 9001:2015 certified by a third party, we have also integrated many quality assurance processes and tools right into our supply chain management to further ensure the highest degree of quality in every part that we manufacture. We take quality very seriously. We are ISO 9001:2015 certified by a third party. Total customer satisfaction is the guiding principle of our organization. We understand that quality is the measure of the trust and faith that our customers have in us. We strive to strengthen our customer partnerships through continually improving our quality management system. Our history of consistently exceeding customer expectations is the result of the shared commitment of every Swihart employee, and is based on clearly evident success factors. We embrace a culture of continuous improvement and teamwork. Pursuing excellence is not just a tag line. It's a way of life at Swihart Industries. Swihart has many metrics in place to ensure the highest quality for all the parts that we manufacture. These metrics are reviewed and evaluated very frequently, so we can identify any areas of improvement in an extremely timely fashion. Our metrics help us hold ourselves to the highest standards in the area of quality. SPC is monitored utilizing QC-Calc software interfaced with our CMMs. 100% layout is performed on 1st piece inspections. In-process verifications include many 100% checks on critical characteristics. Coordinate measuring machine checks are performed two times per day, which gather SPC data to help us hold to the customer required 1.67 CPK (process capability index measurement).